ARSENAL PASSED UP the opportunity to sign Virgil van Dijk from Celtic for £12 million (€13m), John Collins has revealed. The Gunners were among those to be heavily linked with the Dutch defender during his time at Parkhead, but they never made a formal approach. They were not the only ones to make such a judgement, with Liverpool also opting against a move during Brendan Rodgers’ reign at Anfield. 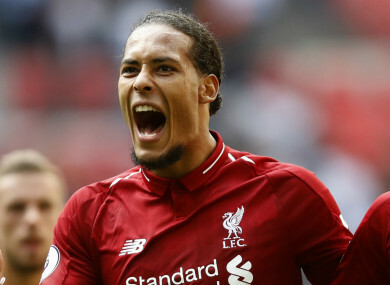 Van Dijk would eventually end up on Merseyside, having made a club record £75 million (€83m) move from Southampton in January, but he could have graced a top six Premier League side much sooner. Collins told beIN Sport: “Arsenal’s chief scout [Steve Rowley] thought he was too nonchalant. “He’s got pace, power, balance, distribution and he’s good in the air. “He can be a bit nonchalant but he is a quality player. Gary McAllister was the assistant to Brendan Rodgers at Liverpool and I told him I hope you’re going to come and take Virgil but Brendan didn’t fancy him and didn’t think he was better than what he already had. Van Dijk ended up joining Southampton for £13m (€14m) in the summer of 2015. He required just two full seasons in England to convince Liverpool of his worth, with Jurgen Klopp not sharing the opinion of his predecessor at Anfield. The 27-year-old has starred for the Reds, with his price tag now considered to be money well spent, and the Netherlands international is chasing down a Premier League title after previously being deemed unworthy of such a role. Email “Arsenal snubbed Van Dijk for £12m as he was 'too nonchalant'”. Feedback on “Arsenal snubbed Van Dijk for £12m as he was 'too nonchalant'”.